Hyundai believes they can significantly improve the safety of airbags with the introduction of a “multi-collision” system. Multi-collision accidents are those in which the primary impact is followed by collisions with secondary objects, such as trees, electrical posts or other vehicles, which occurs in three out of every 10 accidents. Hyundai analyzed multi-collision scenarios in order to improve airbag performance and precision in secondary collisions. They will be implementing the system in new Hyundai and Kia vehicles in the near future. Nice, but HARI will not install it on their hyundai cars for the ph market. You know what i mean. Wink! Yes. 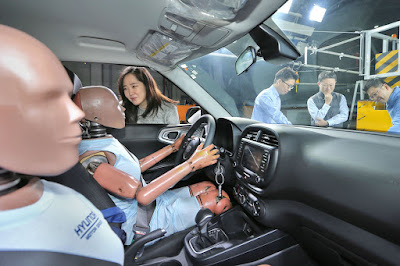 Hopefully one day the article will read "Hyundai to standardize airbags and safety features on ALL (incl. third world sh*t) its vehicles".